Every manufacturer should go solar in 2018. That may sound like a bold, overly broad statement to the average manufacturing business owner, and it’s understandable why. For decades solar power expansion has suffered from barriers like upfront expense, technological insufficiencies, and the consumer belief – however misguided – that solar power isn’t viable in parts of the world that seemingly don’t get much sun. However, after a decade of favorable market shifts, government incentives, and data collection on the efficacy of solar around the world, each of those barriers is crumbling, making cheap, sustainable energy realistically accessible to businesses nationwide. Going solar in today’s market isn’t simply a good idea, it’s become an imperative. The solar power industry is currently benefiting from market factors that make going solar an effective cost-savings strategy for manufacturing businesses with notoriously sizeable utility bills. For one, since 2010 energy produced via solar systems has been getting steadily cheaper than traditional energy sources offered through local utilities. Secondly, the depreciating cost of lean, grid-connected solar systems also allow businesses to spend less upfront and start producing a return on their investment sooner. 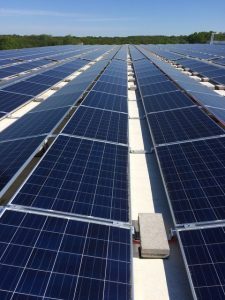 As a matter of fact, the average operation installing a turnkey photovoltaic (PV) system, like the ones offered by Midwest-based solar system provider SunPeak, can expect to produce carbon neutral energy at about half the cost of utility produced energy. As the cost of traditionally produced energy from oil, gas, and coal continues to rise, this gap between sustainably derived energy and traditional sources will only widen. Though we can count on traditional energy sources to rise in price as nonrenewable resources inevitably do, we cannot count on tax breaks and subsidies for the solar industry to always stick around. The federal government currently offers a 30% tax credit to help cover the cost of solar system installation through 2022, while some states like Illinois go even further. In the most recent legislative session, the Illinois legislature created a cash payment system that covers another 25% of the cost of solar installation through the Illinois Power Authority (IPA). In some states with additional solar subsidies and tax breaks, businesses can have their installation costs reduced by as much as 75 percent. 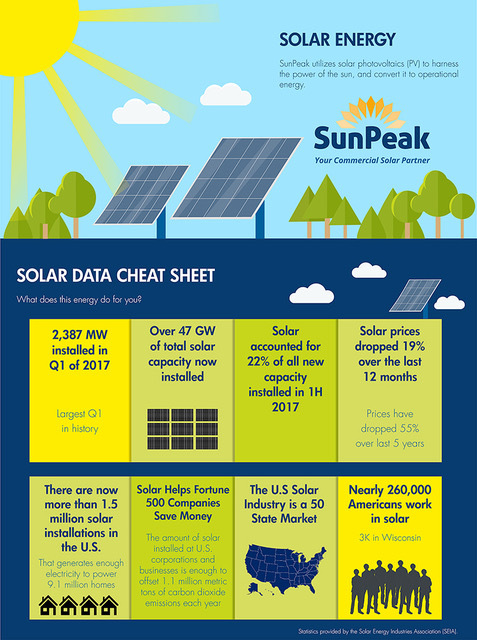 For those daunted by the prospect of navigating a potentially complicated system of financial incentives and cost-benefit analyses, the aforementioned SunPeak also provides free financial feasibility studies, which include an analysis of any public benefits and solar tax breaks available in your region. Solar providers like SunPeak don’t expect their customers to go solar based on blind faith, and instead work as hard as possible to make the process transparent and stress-free. Continued technological progress will likely make solar systems more and more affordable in the long run, however, these massive public financial incentives will probably disappear at some point in the next five years as solar power becomes more popular. For US manufacturers working hard to stay competitive, going solar could be one of the biggest game changers, and now is the time to take advantage of these temporarily favorable market conditions, as well as any free feasibility studies offered by individual solar providers. Atmospheric scientists and solar engineers measure the rate of sunlight hitting the earth, known as solar insolation, in kWh/per area/per year, which allows us to predict how much solar power can be generated in a given region. Germany, the world’s leading producer of solar energy, actually experiences a lower rate of solar insolation than any other state in the United States, except Alaska. Despite these lower levels of sunlight in places like Germany and Spain, solar technology has advanced to the point that it’s still highly effective at offsetting traditional energy consumption. This data proves that even the Northernmost states of Wisconsin, Minnesota, and Maine can consider solar as a real alternative to nonrenewable energy sources. Another common misconception is that even if solar power is viable in the summer months in Northern parts of the US, it will be virtually useless in the winter. However, US rates of solar insolation during the wintertime still allow for solar power to be cost-effectively generated in cold-weather states. Winter is also a time when energy costs and energy usage typically goes up, making solar power an ideal solution for offsetting those increases. 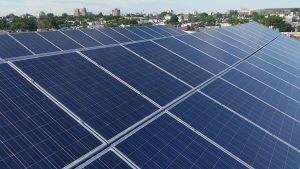 One of the benefits of grid-connected solar systems is that they produce renewable energy for the entire community, not just the operations that utilize those systems. When enough homes and businesses in a given area go solar, energy costs for the community as a whole go down, allowing families running on tight budgets to have an easier winter. 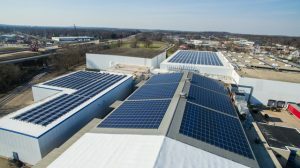 Overall, the impressive levels of solar energy produced on an annual basis far outweighs the reduced production rates in cold weather months, and combined with the monetary incentives available to businesses, manufacturers budgeting for high utility costs could realistically save hundreds of thousands of dollars just from offsetting a portion of their total energy expenditure with solar. Another perceived structural barrier that impacts manufacturers specifically when it comes to installing solar panels is the incompatibility most solar systems have with flat rooftops common on warehouses and plants. However, SunPeak’s globally experienced solar power engineers utilize an exclusive East-West mounting system designed to accommodate flat roofs, while still looking aesthetically pleasing from the ground. These low lying panels are placed in compact formations that result in higher energy production per square foot, thus making the most of the surface area SunPeak’s customers have to work with. Unlike the more commonly used South-facing solar systems, this unique East-West solar panel formation is lighter and lower maintenance, with a more consistent power output that mitigates the typical noon production spike while lengthening power duration in the morning and evening hours. SunPeak’s design also helps Northern states with shorter daylight hours during winter months make the most of the sunlight available to them. With an operation headquartered in notoriously frosty Madison, Wisconsin, this company knows what they’re doing when engineering winter-friendly solar systems around the world. These technological advances offered by exceptionally innovative companies like SunPeak combined with positive market forces have made renewable energy systems an economic imperative that businesses of all sizes now need to consider, which is why 2018 should be the year American Manufacturing goes solar. Other nations around the world competing in the global manufacturing market are noticing the viability of solar, and US companies have a limited window to upgrade their energy production and consumption in order to keep America making things. SunPeak is a commercial solar PV developer headquartered in Madison, Wisconsin. We have the capability to professionally assess feasibility, design & engineer, install, commission, and maintain solar systems that provide decades of emission free electricity from the sun throughout the United States (focusing on Wisconsin, Iowa, Illinois, Minnesota and Michigan.) The SunPeak team is responsible for successfully installing over 450 MW of renewable energy globally, including solar reference projects as distant as Germany, Japan and Canada. This international experience in the solar market allowed us to foster extensive relationships with the world’s best-in-class solar racking, panel, and inverter suppliers, ensuring an optimal blend between cost effectiveness and performance. SunPeak only works with leading solar component manufacturers, who offer proven technology and solid warranties we know we can stand by.